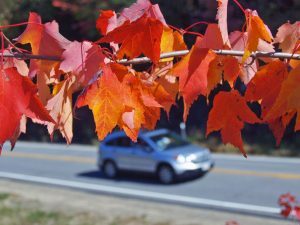 A ride on the Kancamangus Highway is a must this time of year. Just as glorious is the view from the Conway Scenic Railroad or the Mount Washington Auto Road. Of course, you never have to venture far from your room at the Christmas Farm Inn and Spa to find a beautiful nature scenes to enjoy, plus this is a great time of year to gather around the fire pit, roast S’mores and gaze up at the stars after dark. 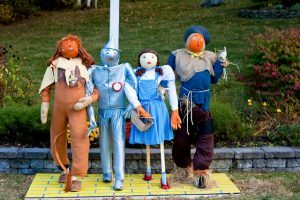 October will bring the popular Return of the Pumpkin People, a village-wide bit of fun in which local businesses recreate scenes from classic pop culture and compete to determine which display is the best. Christmas Farm Inn and Spa has always performed quite well in the annual contest/art show, winning first place last year. The pressure’s on to top ourselves! The witching season delights those who enjoy Halloween fun. For the older kids, the Ghoullog at Cranmore Mountain puts a terrifying twist on role-playing. Smaller ones enjoy finding their way out of one of The Maize at Sherman Farm, rated one of the best mazes in New England by Yankee Magazine. Santa’s Village transforms between Oct. 22-29 into a “Silly, Spooky Halloween Extravaganza” that’s great for the younger goblins. The Pumpkin Patch Express at Conway Scenic Railroad drops children at the “Pumpkin Patch” to choose a pumpkin to carry back on the train ride back to the station. Settler’s Green will host a fall festival on Sept. 24, offering horse-drawn wagon rides, pumpkin painting, a bake sale and more. The same day, Bretton Woods will host Oktoberfest at Fabyan’s Station; Attitash has their Oktoberfest event on Oct. 8-9. The Fryeburg Fair will return Oct. 2-9 for the 166th annual eight day fair – one of the best agricultural fairs in the USA. Columbus Day (Oct. 7-10) will bring another Sidewalk Sale at Settler’s Green. The Jackson Area Chamber of Commerce will host silent auctions, pumpkin carving, pumpkin tastings, magic shows and more at the 2nd Annual “All Things Pumpkin” Festival Oct. 16-31. The New England & Jackson Invitational Pumpkin Carving Contest is set for Oct. 21-23 at the Jackson Village Park. The “All Things Pumpkin” Tour will feature a horse-drawn sleigh ride to view Return of the Pumpkin People business displays on Oct. 22-23. The Murder Mystery Dinner Train also returns this fall aboard the Conway Scenic Railroad.